I am thrilled daily with the foliage combinations of ‘Sparkling Burgundy' and 'Electric Lime' heucheras in my own garden. These lovers of bright light are only two of literally hundreds of varieties of heuchera available every year at nurseries, garden centers and plant sales, with more varieties introduced annually. Heuchera, commonly known as coral bells or alumroot, is a member of the Saxifragaceae family. It is an evergreen, herbaceous perennial that grows as a tidy mound. The plant is revered for its foliage, making a great groundcover or striking accent in the perennial border, or combined with other plants in a container garden. Heuchera’s boldly veined leaves may be heart-shaped, roundish, or even triangular, and they may be scalloped, ruffled, or smooth. The variety of foliage color for heuchera is astounding, ranging from green, chartreuse, pink, red, bronze, orange, chocolate, purple, to nearly black, and every shade in between. 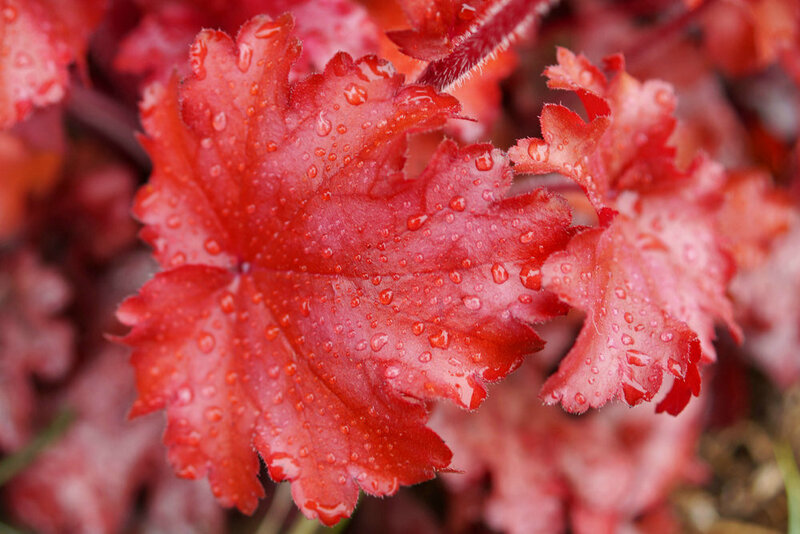 To get a sense of the incredible diversity of foliage color, shape and style, check out this website dedicated to heuchera. The flowers are small and bell-shaped, sitting atop wiry stems, 1-3’ high. Flower colors are usually some shade of red, magenta or pink, hence the name “coral bells,” but they may also be white or green. The airy blooms float above the colorful foliage, appearing in spring and enduring through summer or even into autumn. They are attractive to butterflies and birds, and make nice long-lasting cut flowers. The plants are fairly fast growing with little pest or disease problems. Heuchera does not enjoy hot afternoon sun, but prefers bright light settings. This satisfying plant requires regular watering, but can rot without good drainage. Heucherella is heuchera’s look-alike cousin, but loves more shade. It is a hybrid of heuchera x tiarella cordifolia. 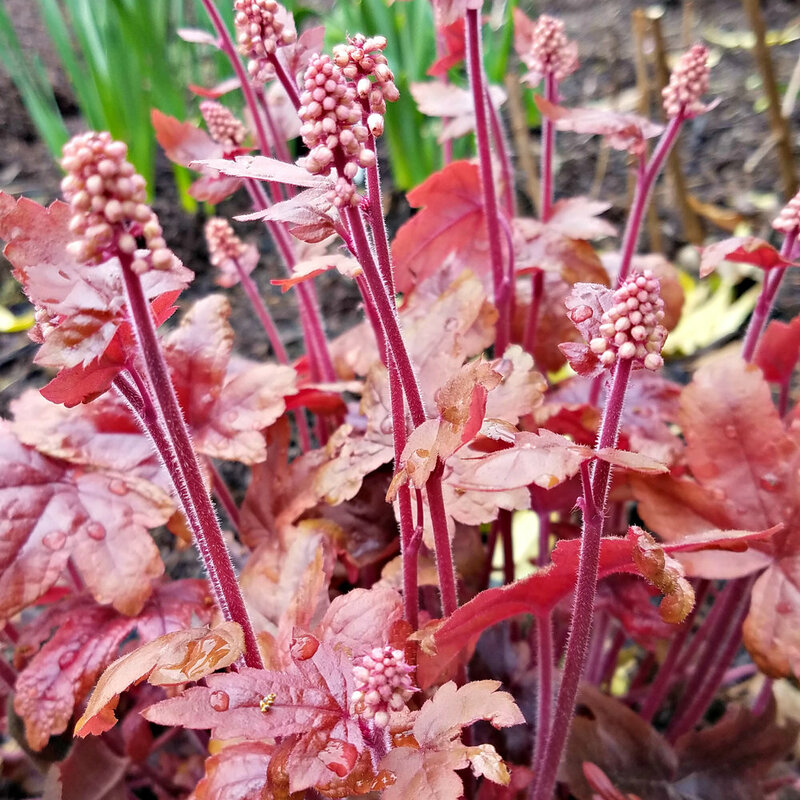 Heucherella is also known as foamy bells, which is a combination of heuchera’s common name “coral bells” and tiarella’s common name “foam flower.” Grow it as a woodland garden groundcover, tucked into a shady rock garden, or as accent foliage in a shady container planting. Both heuchera and heucherella clumps need to be divided every three or four years in spring, so the divisions have time to develop root systems before winter. For a comprehensive “how-to” guide on propagation including growing these plants from seeds and cuttings, check out this link.